Elegant Long Beaded Formal Western Wear Beaded Skirt and Cape with Fringe is a perfect Black-Tie Outfit for any Western Wear Event. Elegant Beaded Tiered Long skirt falls gracefully to the ankle and The Black Beaded Cape is a perfect match to this 25-yard skirt! The Elegant Cape can be worn back to front. The front of this Elegant Long Beaded Formal Western Wear Cape closes with hook and eye or can be work just open with the tank top showing underneath. 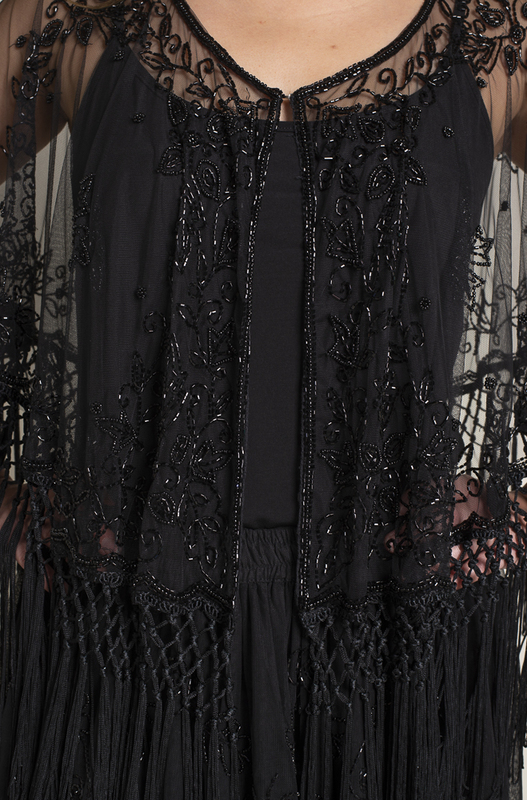 The Beaded long cape drapes beautifully down the shoulders embellished with the soft rayon fringe. Wear one of your tank tops to complete the look. Add one of our beaded black western hats and you will turn heads at any Formal Western Wear event. 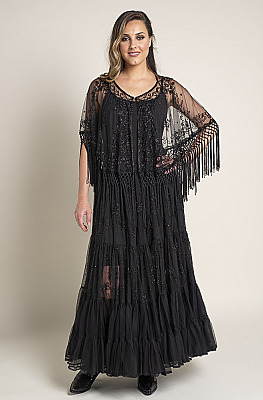 Elegant Long Beaded Formal Western Wear Beaded Skirt and Cape with Fringe is one of the newest creations of Ann N Eve. 100% Rayon Mesh. Hand Was in cold water. Ann N Eve Exclusive.